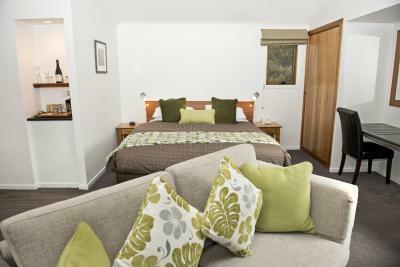 Lock in a great price for Peppers Cradle Mountain Lodge – rated 8.7 by recent guests! The quiet and proximity to Cradle trails. The staff (with the exception of one waitress) were amazingly helpful and courteous. The cabins are very quant and spacious. The cleanliness is questionable as I believe housekeeping could pay more attention to the cleaning. The breakfast that was included in our stay was very good. Wide variety of food. The fireplace in the room was a nice touch. The hikes at the property are amazing. The main lodge and cabin facilities where excellent and the cabins and grounds beautifully maintained whilst still ensuring there was minimal disturbance to the surround fauna and flora. The view for breakfast and dinner over the little lake was just gorgeous recommend asking for a window table. We were pleasantly surprised with a Suite upgrade upon arrival. Location of lodge was close to all the hikes and secluded from technology. Even during summer the lodge and nearby wildlife park is an enjoyable experience. Staff were friendly and we were greeted daily by the wallabies, wombats and echidnas. Would love to stay during the winter times. The resort is located just next to the Ranger Station, and you just have to walk out your door to find an abundance of wildlife, being almost within the Cradle Mountain National Park. You just walk down the hill and catch the bus that takes you around the park (you must stop in the Visitor's Center and purchase before continuing on to the Lodge). We enjoyed the complimentary tea at 4 pm. Very good breakfast too (we purchased in advance with Booking). Amazing time at Cradle Mountain. Lodge is great. Good breakfast. Meals in tavern good standard. View from our room was great. Lots of beautiful walks to do straight from the lodge. The balcony looking out onto the trickling lake was divine. Very relaxing atmosphere and felt luxurious and needed after a long hike at Cradle. Couldn't be closer to the park entry gate! The nature walks around the resort are gorgeous! The location was great. I enjoyed the trails through the property. The fireplace is a nice touch. The breakfast had a lot of options. For people that cannot be without their phones, use Telstra service while here. I was told I wouldn't have any service, but I had 3G almost the entire time. Free laundry services was awesome. 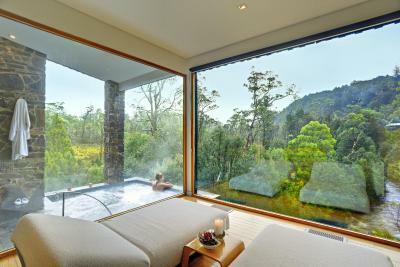 Peppers Cradle Mountain Lodge This rating is a reflection of how the property compares to the industry standard when it comes to price, facilities and services available. It's based on a self-evaluation by the property. Use this rating to help choose your stay! 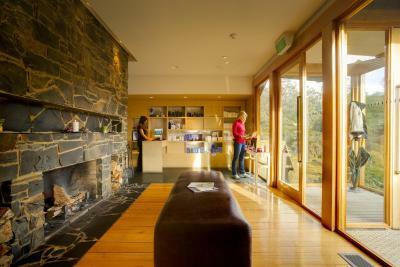 Featuring 2 restaurants and a luxury day spa, the Cradle Mountain Lodge has a selection of wood cabins with views of the surrounding Tasmanian wilderness. A breakfast buffet each morning is included in the room rate. 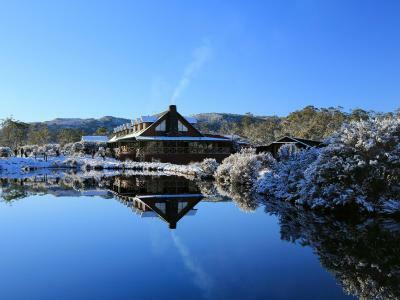 On the edge of the Cradle Mountain-Lake St Clair National Park, the Peppers Cradle Mountain Lodge is a 2-hour drive from Launceston and only 90 minutes from Devonport. The Waldheim Alpine Spa offers a range of therapies and treatments, along with a steam room, sauna, large hot tub and cool plunge pool. The lodge has more than 20 walking trails to suit every level of fitness. Recognized as one of Tasmania’s best dining experiences, the Highland Restaurant features fine dining in a relaxed setting. Guests can enjoy a game of pool or relax by the fire at The Tavern Bar & Bistro. Each cabin includes a gas or wood fire, minibar, coffee table and comfortable armchairs. Luxury suites featuring a spa tub and private porch with outdoor furniture are also available. 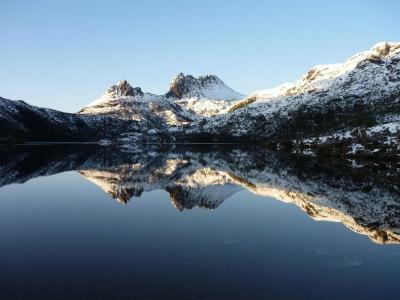 This property also has one of the top-rated locations in Cradle Mountain! Guests are happier about it compared to other properties in the area. 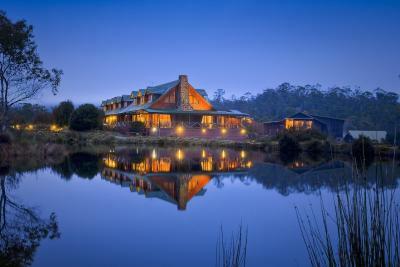 When would you like to stay at Peppers Cradle Mountain Lodge? 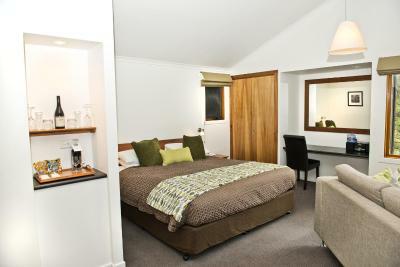 These standard rooms are located close to the Lodge, and offer lake or bushland views. Available in both standard and family styles the comfortable cabins feature a day bed, gas heaters, CD player, coffee table and armchairs. There is also a mini-bar and tea and coffee making facilities. Please note there are no TVs in the rooms. This chalet features modern furnishings, a spa bath and gas heaters. It offers a CD player and tea and coffee making facilities. Features rustic wooden interiors with a wood fire, spacious bathroom with spa bath and shower, and a veranda offering views through the treetops or directly into the surrounding forest. Includes a CD player and a range of quality teas, plunger coffee and hot chocolate. 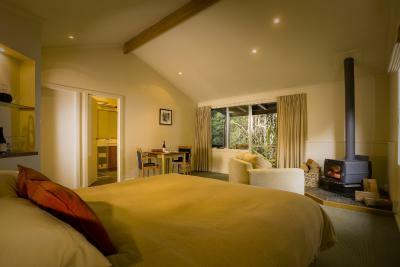 These suites feature Tasmanian wood furnishings, a log fire and a spa bath. They offer an evening turn-down service, goose down duvets, a mini-bar and tea and coffee making facilities including free Cradle Mountain Cookies. 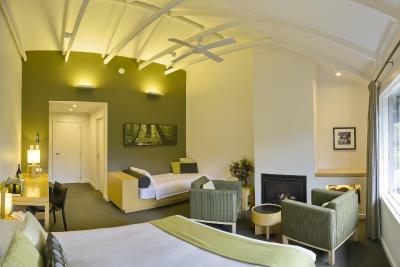 These luxury, spacious suites features a wood fire, a spa bath and separate sleeping and living areas. They offer bushland views, large windows and a hot tub on the balcony. This chalet has a balcony, private entrance and electric kettle. Staying at a Peppers property is a unique travel experience. With a tradition of combining homespun hospitality with the highest accommodation standards, Peppers provides a luxurious and indulgent sanctuary within a premier location. Peppers Retreats, Resorts & Hotels exist on mountaintops, tropical islands and golf courses. Some are set amongst vineyards, while skyscrapers surround others. Many offer proximity to unspoiled beaches or scenic hiking trails. 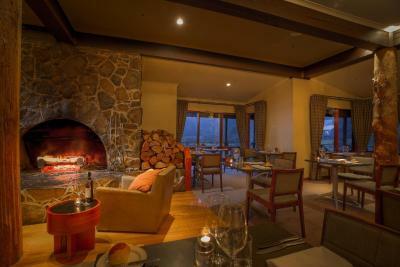 But even in the most remote locations, you’ll always be treated to the refinements that will make your stay memorable. Peppers can be found throughout Australia, New Zealand and Bali. Each Peppers property is different, but they all have in common a passion for delighting guests. Peppers began as a single guesthouse offering a unique local experience, along with splendid cuisine and friendly, personal service. This is still largely Pepper’s core offer today. So if you are after a break from the everyday, in a special location, where you can unwind, rejuvenate and restore, there is a Peppers for you. Because that is what we are all about, summed up in one word. ‘You’. 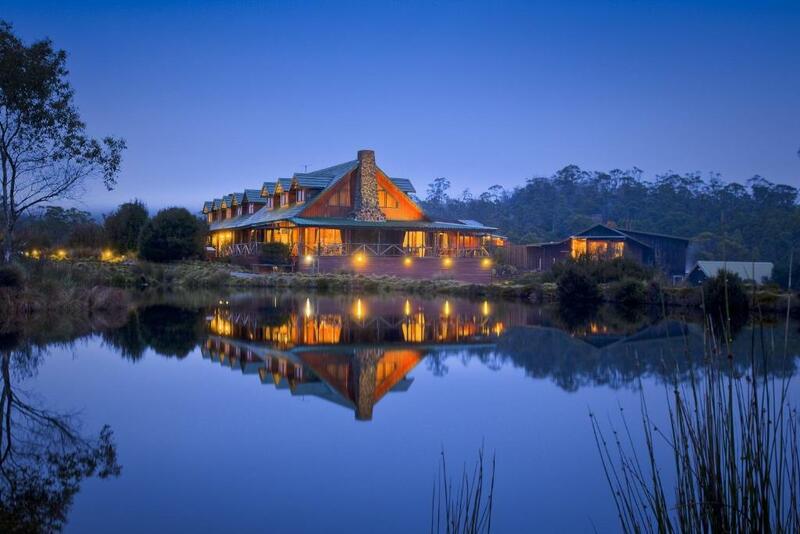 House Rules Peppers Cradle Mountain Lodge takes special requests – add in the next step! A AUD200 damage deposit is required on arrival (around USD143.61). This deposit will be fully refunded 7 days after check-out, as long as there isn't any damage to the property. Peppers Cradle Mountain Lodge accepts these cards and reserves the right to temporarily hold an amount prior to arrival. Please note that from 28 August, 2018 until 30 November, 2018, the King Billy Suites are undergoing refurbishment. You may experience construction noise, in the areas surrounding these rooms, during business hours. 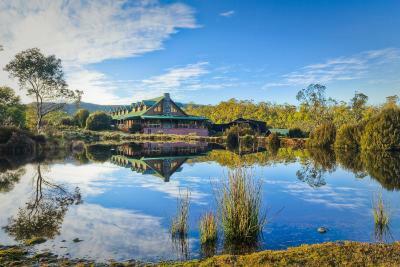 Please note that Peppers Cradle Mountain Lodge is located in 994 mi of wilderness. Because of the properties location, mobile phone service is limited (Telstra is the only service provider with network coverage in the area) and in-room WiFi is not available due to transmission issues to the cabins. Your room does not have a TV. Complimentary WiFi is available in the main lodge building, which is open from 07:00 daily and TV is available in the Tavern, which is open from 11:30 daily. A damage deposit of AUD 200 is required on arrival. That's about 143.61USD. This will be collected by credit card. You should be reimbursed within 7 days of check-out. Your deposit will be refunded in full by credit card, subject to an inspection of the property. Location great. Warm comfy Lodge. Cabin with gas log fire. Without TV or wifi, would have been great to have jigsaw puzzles or board games available. Don’t forget to take your own. The gas heater kept the room toasty warm. Plus the heating lights in the bathroom meant that we had a cozy space to return after cold, wet hikes. Perfect. Great breakfast buffet included, with gluten free options. Close to hikes and visitor centre for the shuttle into the park. Dinner options at Peppers were pricey but good at the restaurant, or a little less pricey pub-style meals at the tavern. Fine for short visit but need to find other options for longer stays. Will definitely be back. New National Park system with shuttle buses was not obvious and very poorly managed by National Parks. Not the fault of the lodge but made accessing the park more stressful and complicated than it needed to be. Was confusing for us but would be almost impossible if English was not your first language. Really needs to be properly sign posted and made clear that day pass entry can only be obtained at the Visitor centre. The location was amazing. Many lovely walks from the lodge and lots of wildlife. Food in the tavern/bistro was good but a bit pricey. Lovely, warm and comfortable room. Coffee is not good as it's machine made, if you wanna order manual made coffee, you would be charged extra dollar. Brekkie is nice and you have various choice. The restaurant is with mountain and lake view. Breakfast was a little disorganised with dirty tables and lack of plates/ cutlery. I managed to show up after hours for book in. The manager showed up after hours and booked me in going above and beyond. Thought the drink prices were very expensive. Paying $19 for a drink that costs $11 at the makers cellar door is a little excessive. The beds are slightly too firm, and the bathroom/shower could do with a bit of an upgrade (but nothing to deter me from staying again). The staff were incredibly polite and provided excellent service. The spa is just what I imagined it to be - enchanting. 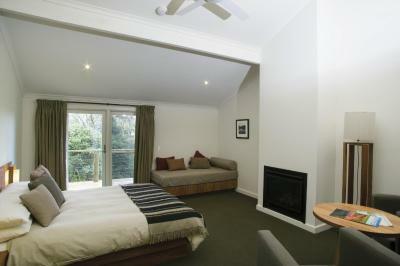 The lodges were comfortable and has a very nice homely feel to it. The walks around the lodge are beautiful and really easy! Location and walks around the property were extraordinary. Loved the open fireplaces, and that the room one was set up ready to go. The rooms were quite basic for what we have experienced before in a Pepper’s Hotel. The bistro food was very average. The pillows were lacking in quality and number. one of our rooms was lacking in tea bags. The location and setting is stunning and the walks around the lodge are magical. 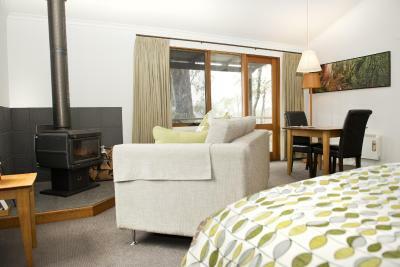 We loved the wood burning fireplaces, the wildlife just outside the door and the accessibility to Cradle Mountain. Great location. 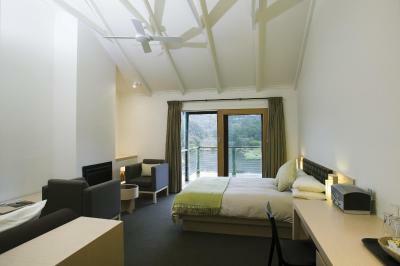 Clean & comfy cabins. Quality buffet breakfast. The staff at Peppers were friendly, obliging & helpful. I think the novel thing in Peppers was really the firewood place in every hotel room . Do check it out! It was convenient to head out and do the Crater Lake Walk. Our knowledgeable guide Paul drove the van to Cradle Mountain Valley and guided us in our climb to Marion( correct spelling?) Lookout . It took us about 4 - 5 hours. An American visitor , my husband & I had the most exhilarating climb we had for years! My husband & I felt it was worth paying AUD$30 or AUD $40per person for this Walk. We panted, perspired, soaked in the breathtaking sights and learnt about the flora , fauna, skinks, wombats and Tasmanian Native Hens! Depending on your fitness level & the weather, there are other routes and Lakes to discover too! You will return to your hotel room rejuvenated & revitalised! Breakfast and dinner was great, staff extremely helpful. The situation of the rooms amongst the bush was beautiful. Room very cosy and comfortable pity we couldnt stay longer, will definitely be back.